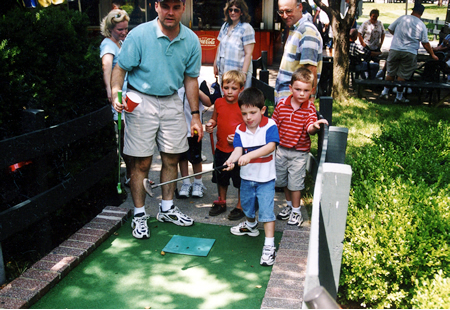 Centerfield Park features two spacious miniature golf courses, each with 18 holes of challenging and exciting obstacles. Enjoy the beautiful flowers, waterfalls and landscaping as you accept the challenge of our uniquely designed courses. Extensive use of shade trees and pines enhance the backdrop. So...no need for sunglasses! After the game, you can re-live your round over soft drinks and other refreshments on our patio overlooking the park-like setting.